If you’re sifting through the web looking for the ultimate dual entry storage sheds with 8 x 15 ft dimensions, one that provides fab access on one side to drive in a sit-on-mower whilst accompanying another set of double doors on the frontage for alternative storage access, here’s a Lifetime model that may spark your interest. Lifetime sheds are a virtually maintenance-free resin based manufacture. An entirely wrapped skin of resin provides the advantages for weather defence, they’re waterproof, unsusceptible to deterioration, no rotting and rusting issues to deal with whilst portraying their trump-card of attraction – Ease of cleaning. We too moved down this resin avenue, I generally hose ours down when the dirt starts appearing, usually after watering the plants at the end of the day; a 2 minute job that brings back the pristine appearance. If 2 sets of double door access are on your agenda, a low maintenance make-up that’s resistant to weather deterioration whilst architecturally designed with stylish features that create an impressive stance to complement any garden, examine what this Lifetime 15 x 8 ft dual entry shed offers. Displaying an immaculate desert sand shade representing a wood style panelling effect, harbouring arched windows that accompany shutters on either side presented with the same tint the doors and vents possess whilst topped off with shingle style roof panels result in the most glamorous of architectural shed designs. Easy access of storage is priority here and this Lifetime delivers. Two pairs of wide double doors are presented on the frontage and down one side, the side doors can be placed on either side dependant on your surroundings. 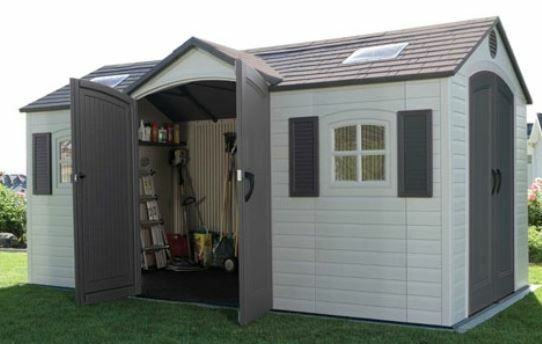 This dual entry shed is part of Lifetimes vast range of low maintenance storage solutions. 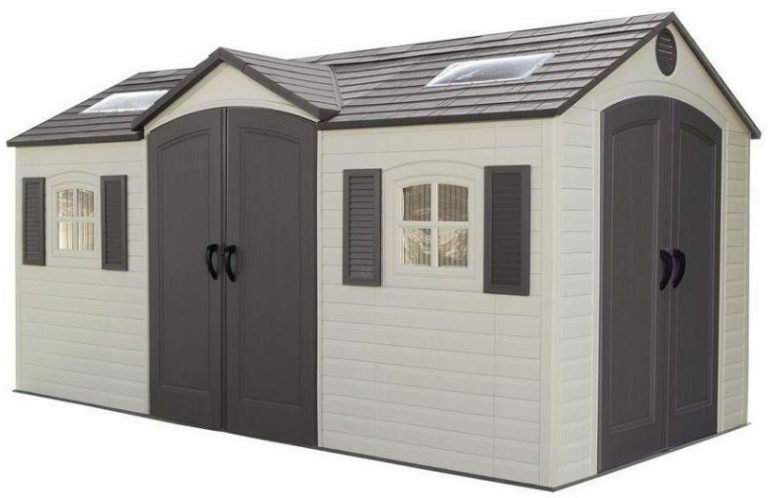 The sister to this model is the Lifetime 15 x 8 ft shed that’s identical apart from having one set of double doors however there is a smaller Lifetime 8 x 10 ft dual entry shed for those wishing for smaller dimensions. 2 pairs of wide double doors provide easy access whilst the generous overall footprint supplies an abundance of storage potential. Architecturally designed stylish with modish eye appeal displays this attractive facade whilst harbouring the advantages resin beholds. Not susceptible to weather deterioration, it’s waterproof and easy to clean, representing the minimal upkeep duties Lifetime sheds are manufactured with. A generous internal height is delivered by the high pitched roof that produces a first class drainage system, air vents provide air circulation keeping the internal atmosphere fresh whilst windows and skylights provide daylight to the interior. A robust structure consisting of double walled panels reinforced with steel provide assurance against changeable weather conditions whilst the built-in floor caters to the pressures of driving in heavy equipment and storing weighty items. How do reviews rate this Lifetime design? On the whole regarding the finished shed, feedback comes through strong expressing the features described above with impressive results however Lifetime have received negative reviews on behalf of their instructions, they sound frustrating. To be fair with Lifetime, lately I have seen them respond to unhappy purchasers relaying poor feedback with respect to their instructions answering with apologies explaining an overhaul of instructions is high on their agenda. When you’re spending a substantial investment to encounter parts not labelled correctly and poor assembly instructions, this only leads to venting frustration on feedback sites, so let’s hope they’ve sorted this problem. We too were very disappointed on arrival of our chosen resin shed. Not one website at the time we purchased mentioned plastic sheds have to be situated on a solid level surface. This delayed our assembly by a week as we thought we better conform to the rules. Upon constructing it was obvious why level foundations play such a vital role, if you’re not level on the base, 8 ft up you’re way out of alignment. Fortunately by adhering to the rules presented us with a very straightforward assembly simply because all the panels lined up with ease. It’s frustrating why these sales sites hide the most important details, happy purchasers are surely their prerogative, just relay helpful information. Rather than opt for a single walled construction our attention turned towards a similar double walled skin presented in Lifetime sheds. Dual walled prevents wafting about in the wind yet these walls are further embraced with a steel structure to which the walls wrap around providing overall stability. 5 A-Frame steel beam trusses span the roof section internally bolstering additional support for peace of mind when the snow falls. The 2 sets of double doors are both a double skinned resin structure further reinforced with steel whilst metal door hardware further enhances a sweet entrance whilst providing additional strength regarding security features. The skylights are polypropylene in manufacture whilst the windows polycarbonate providing a future without problems associated with smashed glass. 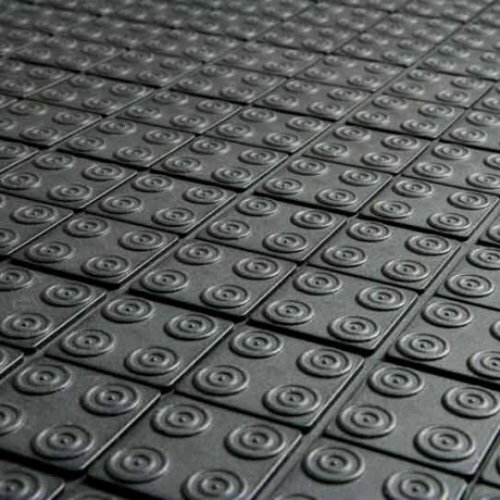 The floor is purposely designed tough resisting cracking and allowing the movement of heavy duty storage, like wheeling in and driving in in weighty equipment. 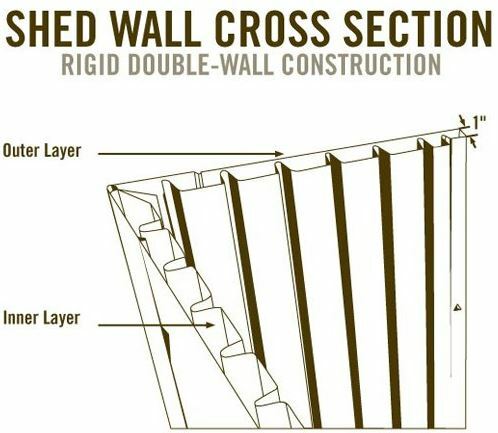 The walls are manufactured from high density polyethylene resin, manufactured through a molding process that provides the enchanting desert sand tint whilst a wood effect panelling formation is accomplished simulating fine details of wood grain embedded within. This polyethylene resin is technically advanced to prevent splitting and bleaching when subject to the sun however the additional merits provided are the easy clean nature without being susceptible to weather deterioration leaving no maintenance issues regarding rotting and decay to deal with. The walls are delivered in sheet form, assembly results in interlocking with the floor and next wall sheet whilst securing into place with screws wrapping around a steel framework providing stability to the overall structure, embracing the shed into a sturdy unit. We find the low maintenance benefits a huge advantage, a wash down every now and again is the only duty required to bring back the spotless shine. A high pitch roof benefits the interior with a copious amount of headroom enabling an adult to walk around with ease, there’s over 2 metres in height from the truss supports down to the floor plus the additional space up in the rafters above the truss system enhances an airy environment. A steep peak provides the advantage of superior drainage allowing no puddles of water to congregate rather the opposite materialises with immediate rainwater drainage. 2 apex styles are delivered on the twinned access 15 x 8 ft shed, one across the centre door access whilst the other covers the main roof expanse. The roofs manufacture is a double walled high density polyethylene resin skin molded into a stylish slate effect, an attractive topping to the structure. Due to the impermeable nature resin beholds, it’s waterproof to the max, doesn’t decay and is easily cleaned providing the advantage of no future re-roofing, the wishes wooden sheds can only dream of. This shed is strong, able to cope with heavy snow-loads due to the 5 A-Frame steel trusses fortifying the resin panels that make up the top. The roof stretches out beyond the shed walls creating eaves prohibiting the chance of rainwater entering in at the top of the facade. Embedded within the roof are 2 large and 6 small polypropylene skylights. We find a built-in floor provides the upper hand with regards to the majority of metal sheds not entertaining this feature, storage is kept dirt free due to the advantage of wind unable to blow the outside environment under the shed walls, same goes for the non occurrence of rainwater puddles appearing inside the shed. 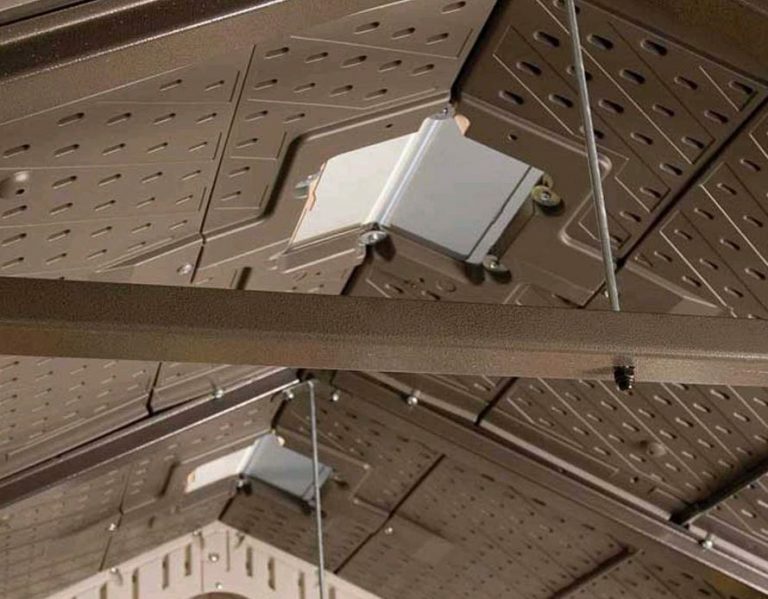 Lifetime sheds have a thickset resin floor manufactured from polyethylene, resistant to oil and solvent stains, will not crack or chip yet provides an anti-slip surface. The resin floor design is further strengthened to subsist the pressures of demanding use, whether you are wheeling in heavy gardening equipment, driving in a sit-on-mower or storing weighty items, the floor’s purposely designed to survive the stresses. The floor is delivered in sheet form, interlocks together making up the expanse of the base whilst adjoining the walls results in a true built-in feature. 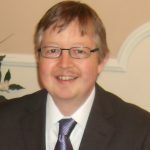 It’s in one’s best interest to follow the manufacturer’s recommended guidelines and anchor the shed floor down into the foundations to provide stability against high winds. Read the internal measurements below to check whether this meets your required dimensions however there is an approximate 15 x 8 ft footprint here equating to 749 internal cubic ft capacity, enabling a home and garage clearout with ease. These dimensions generate an abundance of storage possibilities. Popular storage solutions are to accommodate gardening equipment, long handled tools and ladders, patio seating & accessories, barbecue paraphernalia, parking lawn mowers, bikes, mobility scooters and sit-on-mowers whilst the wonderful access accomplishes the quickest of kids toys tidy-ups. Extensive headroom is generated through the high pitched roof resulting in a non bent over scenario or hemmed in feeling whilst creating an un-claustrophobic environment are 6 small skylights, 2 large skylights and 2 windows delivering internal daylight. The windows open half way on this quality model whilst up above in the apex peak on either side are built-in air vents providing a fresh circulation of air. A presence we find keeps storage in prime condition as they eliminate ant sweaty plastic atmosphere. Presented with this shed are 4 corner shelves, one straight shelf and 2 peg strips with metal hooks. We picked up another tip and installed stand-alone shelving, a popular alternative many choose to include as these can accommodate so much more storage weight. If you’re after superior access this Lifetime facility delivers. At the front between the 2 stylish windows and shutters presents one set of double doors whilst having the option of installing the other set on your preferred side generates additional access for rolling in other storage possibilities like a sit-on-mower. The doors makeup is steel reinforced polyethylene resin harbouring the same weather-defence credentials the walls and roof behold, consisting of good sized handles containing metal latches and galvanised steel hinge pins running the full length of the doors. To prevent the wind swinging the left hand door, 2 dead bolts situated top and bottom of the interior side enable that door to be kep closed whilst security wise a padlock clasp is fitted to enable fitting a padlock to secure both doors. The doors dimensions are 56 inch width x 76 inch height creating wonderful access. The beauty of quality plastic sheds like this Lifetime manufacture is the polyethylene resin makeup providing weather-resistance, durability and waterproof credentials. However the additional benefit, the reason for their growth in popularity is their easy clean nature. We generally hose ours down when the muck starts to build, it’s a 2 minute job which I enjoy, sure beats the rotting headaches my last wooden facility was prone to. Now and again we do find dirt becomes ingrained however we picked up a simple tip by applying 2 cups of white vinegar into a bucket of warm soapy water and removing with a soft brush followed by a quick hose down does the trick. This manufacture allows you to chuck away your old varnish and paint, doesn’t represent any future re-roofing procedures, it will not rust, rot, peel, fade or crack, just a quick clean down every now and again is the only maintenance required. 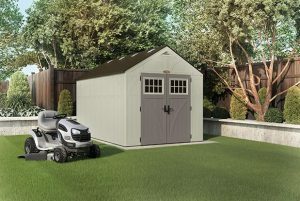 Lifetime predicts it takes 2 adults 6 hours to assemble this shed however how many of us are experts in building sheds? Very few, so expect at least a day as this is the general consensus read from feedback. 15 x 8ft is a large shed. Let’s hope Lifetime have updated their instructions as they promised, to enable a trouble-free build. Lining the doors up have presented a few problems however many have found this straightforward so I’m putting this down to their poor instruction step by step guide. The most important measure to undertake when erecting a resin shed is preparing solid level foundations for the shed to sit on. Many prefer concrete foundations due to the sheer size however a few prepare wood foundations instead. Making sure it’s level is key. Although we were delayed a week as no website mentioned the foundation rule in their sales patter, we did conform after inspecting the instructions and rolled assembly without any hick-ups, simply because all the panels aligned without fault. It’s common sense really, if you’re out of cinque on the base, by the time you’re 8 ft high the panels will be way out of alignment. On the whole, those who conform to the rules generally provide excellent feedback as their construction becomes hassle free. You will require a step ladder as the roof is 8 ft high, whilst movement around all sides of the shed is required for fitting the roof. Most of the build however takes place inside the shed. Household tools will complete assembly. We assembled a few bits prior to assembly like fitting to door handles and other jobs which quickened the build. Also reading through the instructions beforehand to become acquainted with the process and laying all the parts out in order to the step by step instruction simplified the whole job. Tracy and I really enjoyed the build, we made a day of it. Another few tips are to keep the panels in the shade until fitting to prevent expansion if subject to red hot sun. Another great tip was to use WD40 oil or washing up liquid to help interlocking the panels. Sometimes they can be a bit stiff. Once assembly was complete we took the advisory measure and anchored the shed down into the foundations for security against adverse weather conditions however we had to purchase the correct foundation screws as these are dependant on your base material and are not included with the shed. 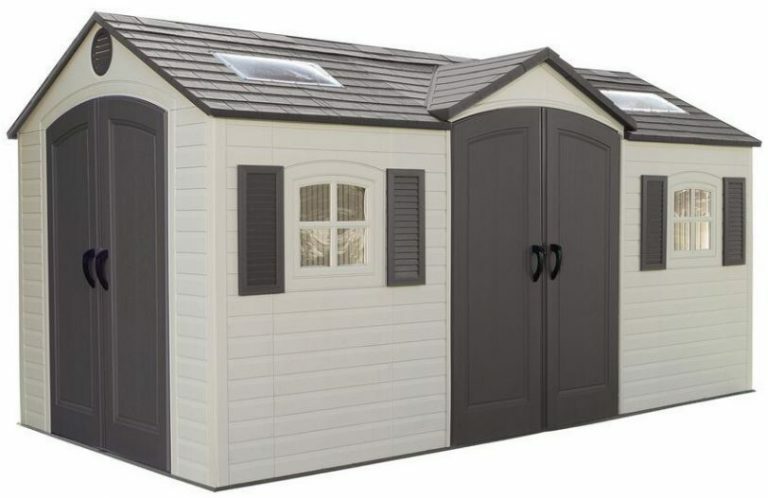 Although competition is mighty fierce on quality plastic sheds due to their low maintenance benefits, dual entry sheds this size are rare leaving Lifetime dominant on the market place with this particular model. Shed Sizes: A visual page of all quality resin sheds reviewed on this website. They start off from the smallest footprint, working up the ranks. Scroll down to your preferred size, select the shed image to read an in-depth review. 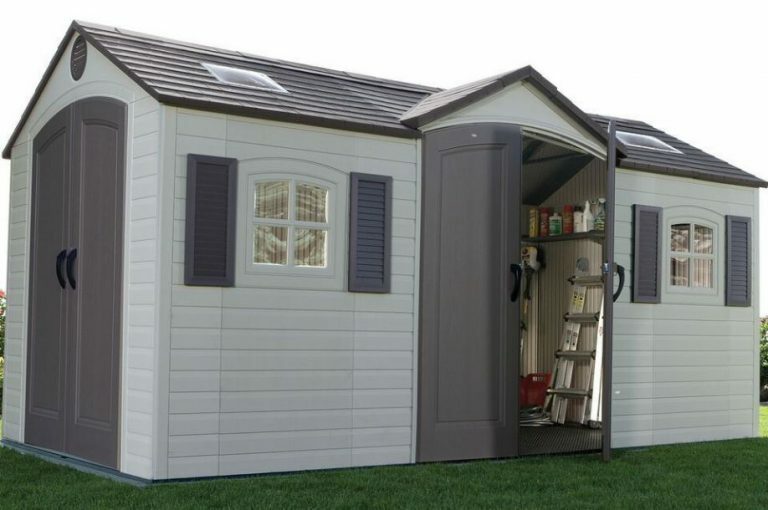 The Lifetime 15 x 8 ft Dual Entry shed provides excellent access for those wishing for a double door entry system. It’s a sturdy facility built with steel reinforcements wrapping around its low maintenance facade. Displaying an admirable stance with architectural features designed to complement any garden with modish style whilst the easy clean benefits encapsulating the entirety of the shed are the main attraction. Resistant to rusting, rotting and decay present a future of only a wash down once the muck appears, the reason for their popularity. 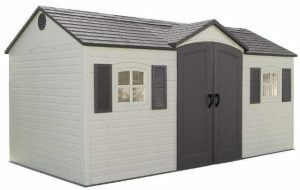 This shed is covered by a 10 year limited factory warranty in the USA and Canada. If you have any questions, I’m always happy to help. Please drop them in the comment section below. Do you know if these sheds can be painted. If so what kind of paint would they require? Thanks for reading about Lifetime’s dual entry sheds. No, these Lifetime sheds cannot be painted. They are weatherproof and easily cleaned but cannot be painted. If you are considering painting a resin style shed and large dimensions are on the agenda, take a look at Oakland’s 7.5 x 11 ft shed. This is the only resin range to my knowledge that is specifically designed for painting. However this only has one entrance. 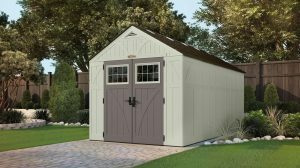 Thank you for writing this helpful article on storage sheds! I live in a fairly small house with a large backyard (not sure who thought to design this property in this way). I’ve been thinking about installing a shed to create space for storage and to make use of the extra yard space. I didn’t really know where to start, but this has given me a good idea about what to look for. Lifetime looks like an excellent product indeed! Thanks for dropping by and reading this qaility plastic shed review. If you take a look at the full selection of shed ranges in the top menu there’s a whole range of low maintenance sheds varying in different sizes an styles to choose from. Select the shed image dependant on your preferred size to read the review. Yeah, the beauty of having a shed is that you can move all your outdoor gear from the home and create more space. 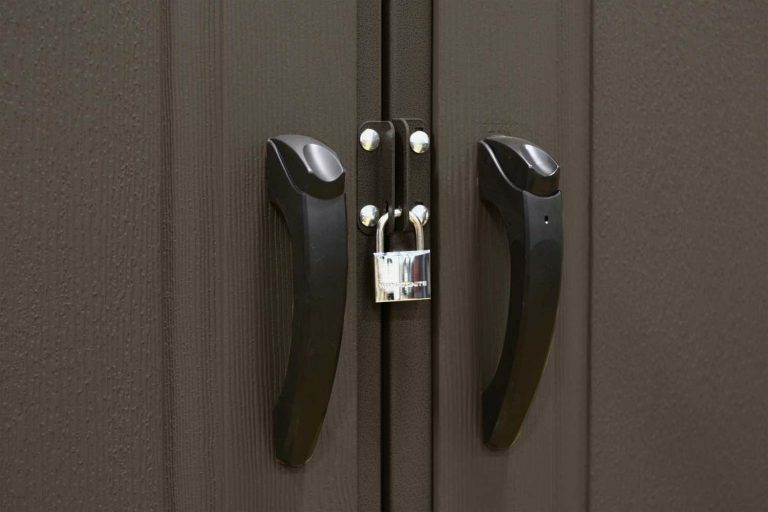 Lifetime are huge and well established in the USA for manufacturing low maintenance storage units and sheds so I’m sure you’ll find something to suit your outdoor space. Wow, that’s a great review for this storage. This lifetime dual doors really open my door and the most impress me is the architectural features. Not only the look is evergreen but also a modish style that will also boost up my garden appearance. With the price listed, I think is very reasonable and affordable for those seeking for building their storage compartment and value for money. Wish I could get 1 soon. Yeah, this is one fair sized storage shed, fab access and low maintenance benefitting from an easy to clean surface. When you compare against a wooden shed of this size they are quite reasonably priced and you have the appearance of such a wonderful architectural stylish shed sat in your grounds. 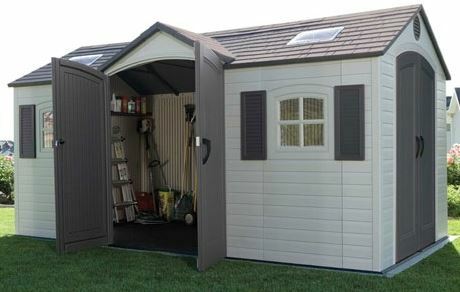 If you have a lot of storage and the likes of a drive on mower to which you prefer 2 sets of doors for easy access, this is a popular shed. There aren’t that many double door sheds this size on the market so the choice is limited somewhat however if one set of doors is your requirements then the selection is good.